Khalil Marrar brings us a closely reasoned, powerfully documented, and gracefully written analysis of the OTHER lobby and efforts to shape US policy in the Middle East. A valuable antidote to the simplicities that continue to distort this long running tragedy. This is an important and much-needed book. 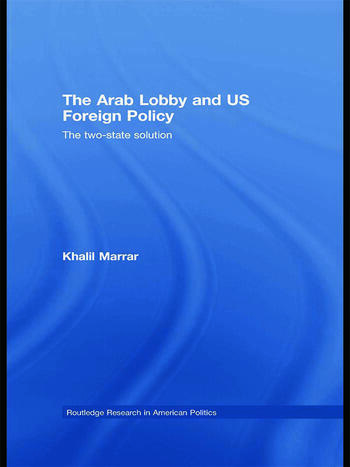 Marrar uses the politics of a two-state solution for Israel and Palestine as a window through which to see the activities and prospects of the pro-Arab lobby in the United States. Part of the creativity of this work is that Dr. Marrar not only studies how pro-Arab lobby groups in the U.S. have tried to influence public opinion and foreign policy, he also shows how the arrow points in the other direction—the way that the Arab lobby is influenced and constrained by events in America and abroad. This thorough and provocative examination helps fill a tragic gap in our knowledge of ethnic interest group politics, and serves as a must-read for students of American foreign policy and ethnic interest group politics.